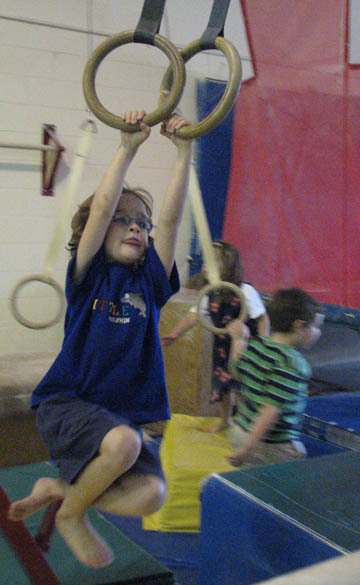 She wanted a gymnastics party, because as far as she is concerned, if you can’t climb it, jump on it or jump off it, it is no fun. For those people who are deluded into thinking that at least girls are calmer than boys and don’t treat the house like a jungle gym, I invite you over to my house to witness Boo do things like leap from the top of the bunk bed like a spider monkey to the floor. Or worse, to the rocking chair. Here are several of the kids waiting for their turns. The tall boy in the white shirt is Boo’s boyfriend. Isn’t he cute? Well, actually, turns out he’s one of her boyfriends. The little guy behind him is the other one. Too bad you can’t see him better, because he’s cute too. We discovered this the other day when Boo announced, “I have a boyfriend and D has a girlfriend!” Odd way to put it, but we’ll play along. “Who are they?” Maya asked. “Well, I’m D’s girlfriend and C is my boyfriend.” We pointed out that it sounded like she has two boyfriends and she was just delighted with that notion. I’m going to have to watch that one closely. Someone just found my site by googling “what judaism means to me.” I find this odd. It doesn’t seem to be the sort of thing the internet is going to tell you. Speaking of, we took the whole family to synagogue this Saturday and plan to continue. We fell out of the habit at our old shul because there was nothing to keep the kids engaged, making the whole experience increasingly unpleasant. We are back on the wagon, though. Asher threw a huge fit because services bore him silly. In truth, I sympathize completely. Just sitting and not being allowed to doodle, or knit or read something else at the same time is difficult for me as well. He solved his problem by refusing to enter the sanctuary, wandering around the rest of the building until he found a friend. I solved the problem by reading the Torah (and commentary) in great detail. It was actually quite nice. I think we all enjoyed the experience more than we expected to, which is good, because we are determined to make this a regular activity. Jasper has started intermediate training at Petsmart, where he did the beginner class. Same instructor too. She is great. He’s learning to stay longer, wait (which is different than stay), and heel. Heel is the one I just couldn’t quite figure out on my own. I did have a go at it now and then, and something must have sunk in, because he got it the moment I tried and while other dogs are making it 4 or 5 steps down the aisle before bolting, Jasper makes it up one aisle and down the other. Of course, it helps that he is brilliant. Our latest move is teaching the dog to ‘touch.’ “Touch ball” is this week’s command. Every time Jasper pokes the ball with his nose or paws at it, he gets a treat. At first, he found me waving the ball in his face very annoying and tried to bite it. But he soon clued to. The instructor has great plans for ‘touch,’ like teaching the dog to turn off lights or pick up their own toys and put them away (I asked if I could bring my kids to the next class, so she could teach them that trick too). This class is smaller than the beginner, not surprisingly. There are only 4 other dogs. One is a tiny little poodle, which I find odd. Most dogs in training classes are large, I guess because most people aren’t concerned about being able to control something that weighs only 7 lbs. I was glad to be going into the training room and away from the crazy dog stalker, but she followed us in! She sat beside Jasper and kept trying to pat him, but he was having none of it. I don’t know if he independently decided she was nuts, or if he was picking up vibes from me. When the class ended, I confess bolted ahead of the others, leaving the stalker trapped behind the other dogs going out the door, and then quickly left the store, double-checking that no one had followed me from the parking lot when I left. There’s the down side to having the most marvelous dog in the world. The first bat mitzvah I attended was that of the daughter of one of J’s colleagues. I didn’t know the kid or the synagogue. It was an eye-opening experience. It was an Orthodox synagogue, one that would probably be described as ‘Modern Orthodox.’ So I wasn’t particularly surprised that the bat mitzvah was on Saturday evening, rather than during a service. The rest of the experience was a surprise, though. The kid read a couple of prayers (which could have taken her all of half an hour to learn, as she went to Jewish day school and had been taking Hebrew for 7 years at that point). She then made a speech. I expected a speech on the parsha (Torah portion) of the week, but nope, she just picked a topic. Thirteen years have elapsed between then and now and I still remember that topic clearly. It was: What Golda Meir Means to Me. Even accounting for the fact that the kid was 12 years old, it was lame. It sounded just like the essay Maya wrote not long ago on why Meir is a Jewish hero, which took her a day to write. Golda Meir is an easy bulls-eye as far as proving Jewish heroism. After her speech, the rabbi came up and praised her for all her hard work, and I couldn’t help but wonder how he said that with a straight face. I couldn’t imagine that he really thought this child was so intellectually weak that this paltry effort should be praised as hard work. He gave her a pair of candlesticks and we all went and had lunch in the elaborately-decorated events room. I know that different Orthodox communities celebrate bat mitzvahs in very different ways and I don’t know all of them, so please don’t view this as a condemnation of all Orthodox bat mitvahs, but I did look at this one and vow that any daughter I had would not be treated as such an intellectual light-weight. I was talking recently with the wife of a Hasidic rabbi and asked her if they did bat mitvzahs for the girls. They did, she said, then went on to describe pretty much what I’d witnessed at this other place. She went on to tell me that in the classes she taught, she concentrated on how to be a good Jewish adult and woman and proffered the opinion that the girls’ experiences were actually more meaningful than that of the boys, as the boys were so busy stressing out over learning the Cantillation and their Torah portion that they couldn’t absorb any deeper lessons on becoming a Jewish adult. I think she’s selling both the boys and the girls short, as I think there is enough room in the average kid’s brain to learn how to chant Torah and how to be a good Jew, all at the same time. I confess, I did not tell her so. She also told me that the girls are delighted to not have to go through the trials of learning how to read the Torah. I believed that. A couple of years ago, after witnessing her cousin’s bar mitzvah, Maya announced she wasn’t having one. Shyer then than now, she watched him up there in front of everyone, chanting and even occasionally making a small slip-up, only to be saved by the rabbi, and decided she would die if forced to do that. But I believe she will. I’ve seen the pride, relief and accomplishment on the faces of kids who have just successfully completed their Torah portions. I’ve felt it to, after I read from the Torah in Israel. There’s a great deal of satisfaction in struggling with something truly difficult and mastering it, then demonstrating that mastery in front of your whole community. I cannot help but think that while the girls who do nothing more than a prayer or two and a speech on what Golda Meir means to them might initially feel relieved to have avoided all the hard work they see their brothers doing, ultimately they realize they’ve been dissed. Their community is subtly sending the message that they can’t cope with anything more. I know that isn’t what those communities intend. They are doing their best to get around the problem that they believe fundamentally that girls cannot touch the Torah while at the same time trying to give them the same sense of welcome into adulthood the boys have – different, but equal is the phrase they like to use. But of course, it isn’t equal, not when it takes a boy a year or two to prepare for his coming-of-age, and the girl really needs no more than a month or two for hers. So, despite all the stress I’m facing preparing for Maya’s bat mitzvah, schleping her to shul school, the inevitable battles over practicing her Torah and Halftorah portion, the nerves that will no doubt be involved, I’m still grateful to be doing this. I can’t wait to see the look of pride, relief and achievement on my daughter’s face, well earned. I confess that for years, I’ve been dreading Maya’s bat mitzvah. They are such huge deals and it all seems so overwhelming to handle. Maybe it is because I converted and therefore never went through one of my own (or, more likely for my generation, watched my brothers go through bar mitzvahs), but I’m not sure that is all, because J is pretty much terrified too. Her bat mitzvah date is April of 2009 – a year and a half away. I thought that was enough time to keep my fingers in my ears and loudly and tunelessly sing, “Lalalala, I can’t hear you” for a while longer, but apparently not. A few days ago, a friend whose kid is having her bat mitzvah about the same time asked me if I’d signed Maya up for her class at shul yet, and was I going to the meeting? Huh? I knew nothing. J knew nothing. So I called the synagogue, where the nice secretary peppered me with questions – how much is she going to read? Are we having our evening even at the synagogue? Are we having the lunch kiddish there? Will we be doing a Friday night thing, or Saturday morning thing? I dunno I dunno I dunno. So I went to the meeting, where I was happy to see I wasn’t the only perplexed parent there. I realized that it was in fact high time Maya start the classes, as apparently they are supposed to take them for 1.5 to 2 years. I can’t figure out what it is going to take so long to learn, since she can already read Hebrew fluently and knows many of the prayers. As far as I can tell (but as I said, I’ve never done this before), she needs to learn the cantillation. The Torah is a complicated thing to read. Hebrew for grown-ups doesn’t have vowels. You can put the vowels in, as they are marks that go under and over certain letters to let you know, for example, that the ‘t’ sound will be ‘ta’ or ‘to’ or ‘ti’ but after you learn how to read fluently, you drop the vowels. So no vowels in the Torah. There are lots of other little marks on the words, though. They tell the reader how that word is to be chanted. All the different marks, called trope, have their own specific tune and the kids need to learn them so they can properly chant their Torah portion. This does strike me as nightmarishly difficult and so I do see requiring a far amount of prep time, but now I’m not so sure, since Maya came home from her first class at ‘shul school’ last week with a page of the names of all the different markings, and began singing them to me. Next! Okay, it isn’t that simple, but she certainly is sucking up the information. At least one of us has a brain. I panicked at the meeting when I discovered that classes are on Tuesdays and Thursdays only. I asked the Rabbi about tutoring as, I explained, Maya has piano on Tuesday and delivers her papers on Thursday. I know one has to make priorities, but piano is unmovable and I think having a job is very good for her. To bad. The tutors are booked solid. Thursday seemed more flexible, but then I saw that the class was currently populated with 4 boys from her grade at school. Nuh-uh. One boy’s mom came over and told me if I put her in that class, they’d carpool her there and back. That’s very sweet, I told her, but Maya will freak if I put her in that class. But, said the mom, they are very nice boys. Nice? Nice has nothing to do with it. They have penises and nothing else matters. So I did my TV show yesterday. I used to drag cameras out to events and film them so I could show those instead of my awkward self, but my self has gotten a lot less awkward in front of the camera and I’ve changed how I do things. The last few shows, I’ve just gathered people in studio and had a discussion on some topic or another. The obvious topic this time was funding of religious schools. My guests were like the start of a bad joke – a Jew, a Christian and a Muslim walk into a TV station … But they were great – articulate, well-informed and smart. I particularly liked the Muslim woman. She’s a very outspoken and involved woman and I was surprised, when I met her, to see that she was a tiny and very young-looking. (I wonder how many men underestimate her based on that?) Anyway, she brought her outrageously cute young son and I brought my three, and we abandoned them in the Green room with construction paper, markers and orders to behave. I wasn’t really worried – Maya is very responsible. Turns out they were all having so much fun that the little guy didn’t want to leave at the end since mine were staying while I taped my introduction. 1. It will take money away from public school. Schools are funded based on how many students are enrolled. Just because another school is now also getting money doesn’t mean that first school will receive any less. No money will leave the system. Yes, they will have to put more money into the school system to pay for the extra students, but since we are talking about only an extra 53,000 kids (this is a very, very small percentage of Ontario students), it isn’t going to break the bank. And, as one guest pointed out, if all the parents sending their kids to religious day schools suddenly decided to pull them and put them in public school, as is their right, the government would have to find the money, and would. 2. Religious day schools are against Ontario’s values of multi-culturalism and those students will grow up less tolerant of others. This one is just silly. The Muslim guest was a former principal of an Islamic school and pointed out that her students graduated with a strong sense of their own identity and self-esteem, and were more likely to comfortably integrate into society (which they’ve obviously been doing all along, with soccer, and neighbours, and inter-school tournaments). Providing a child with a strong sense of who he or she is does not make them less likely to be an involved citizen. 3. Tons of kids would leave the public system for religious schools, taking even more money out and segregating kids more. 4. The Muslim schools will become terrorist breeding grounds funded by public money. Again, my Muslim guest answered this well. Firstly, she pointed out that the schools already exist and no one has a problem with how they are teaching their students, so why would that change with public funding? And secondly, as it stands, the schools have standards enforced by the parents, who expect a good education for their children, but they do not have to keep up to provincial standards – and with lack of funds, some of the smaller schools struggle to do so. By providing provincial funding, all these schools will be brought under the government umbrella and forced to keep to provincial standards. The extra scrutiny means the chances of anyone teaching hate or intolerance is less likely, not more. So, it was a good, in-depth discussion. Too bad more people won’t see it. In some ways, it is difficult to discern how the broader Jewish community views those who have converted to Judaism. Of course, there is the ‘official’ line, but finding out what people really think can be more difficult. It seems that the best way to find that out is to ask the Jews by choice themselves how they feel they have been welcomed in their chosen religion. Both the Torah and Talmud instruct that once someone has converted, they are as Jewish as any other, to the point that their conversions are considered irrelevant and not to be referred to. They are not ‘converts,’ but merely ‘Jews.’ But Jewish experiences in the diaspora before the last few decades made Jews very suspicious of those wanting to join them, and there is some evidence that the suspicion hasn’t completely disappeared. It doesn’t help that Judaism is more than just a religion, but a culture, even an ethnicity. Some – both those converting and born Jewish – question the possibility of successfully joining someone else’s culture. Add to that the controversy over who does the conversion, that the Orthodox movement does not accept conversions performed by those of other movements, and the question of acceptance is of real concern. Every Jew by choice interviewed for this article remembers facing negative comments about those who have converted. Ironically, these almost always came from people who did not realize that they were speaking to a convert. Many Jews by choice find it easy to dismiss such remarks, and the people who make them. He also points out: “It is a glass-half-full kind of thing. You will find what you are looking for.” He explains that he believes those expecting acceptance are more likely to find it. Another Jew by choice, Wayne Moore, said something similar. He feels you get out of life what you put in, and someone who converts with sincerity and immerses themselves in the community will be fully welcomed. While Walsh and Moore haven’t found that their decisions to convert for their Jewish families has made their acceptance any more complicated, Christine Kessler admits she sometimes feels judged by those who think she converted to marry her husband, Gary, a born Jew. She finds this a bit frustrating, especially as she had decided to convert whether she married Gary or not. The mere fact that Kessler and some others who converted before marriage feel the need to point out that they would have ended up Jewish anyway demonstrates that there is still some stigma around converting ‘just to get married.’ Another Jew by choice, who we’ll call Sara, as she declined to be named for this article, describes her deep frustration and hurt at being asked a number of times if she’d stay Jewish should her husband leave her or die. Sara was not the only convert who not willing to be named. Their opinion was that while they weren’t ashamed of it and would tell people if they asked, it just isn’t anyone’s business and they see no reason to advertise it. Interestingly, the most obvious source of potential rejection – converting under a non-Orthodox rabbi – had little effect on the non-Orthodox Jews by choice who were interviewed for this article. While some kept within their own smaller Reform community, others are fully involved in the wider community and have found the rabbis of Ottawa to be completely welcoming. While obviously Orthodox rabbis do not consider these Jews by choice to be Jewish according to halacha (Jewish law), and would not perform a marriage or bris for them, when not in that sort of situation no one spoken to has ever been treated as anything less than a full member of the community. Clearly, acceptance into the Jewish community is an issue fraught with emotion for many people who have converted. But despite the fact that prejudices and problems still do exist for those who have chosen to be Jewish, everyone interviewed has found Ottawa to be a welcoming and largely non-judgmental Jewish community. Here’s the column I posted for a day once before, then realized it hadn’t actually been published and took down. Now it has been published, so I’m putting it back up. I am doing a three-part feature for our local Jewish newspaper on conversion. This first piece is a basic overview. The second one was a lot more fun, looking at why people convert. I got to ask people all kinds of personal questions. But as that one hasn’t been published yet, I have to wait to post it. Conversion to Judaism is as old as the religion itself, but beyond the Biblical period, it has only recently had any impact on Jewish life. That being said, in the past few decades, the impact of conversion has been significant. Opinions on it range from viewing conversion as a realistic way to help save the Jewish people from extinction to the belief that it is actually one of the primary threats to the continued survival of the religion. As with most contentious issues, the truth probably lies somewhere in between. In biblical times, conversion was common and easy. All it required was joining a Jewish household (through marriage or as a servant) or merely deciding to be Jewish. Nothing special had to be done. The convert simply had to start behaving as a Jew and following Jewish law. Talmudic times saw the establishment of a conversion process and ceremony. Author Lawrence J. Epstein writes in his book Conversion to Judaism that most comments in the Talmud on conversion are positive, none more so than one made by Rabbi Johanan, who said that God exiled Jews from Israel for the express purpose of increasing the number of converts. While this seems to be absurdly extreme, Epstein points out the converts must have been viewed as very valuable, to have someone use their increase as a justification for Jewish exile. However, with the rise of Christianity and anti-Semitism (from Christians and Muslims), the Jewish view of conversion became less positive. Proselytizing and forced conversions were fundamentally un-Jewish and cast a negative light on conversion in general. Further, with the rise of anti-Semitism, conversion to Judaism became increasingly dangerous, both to converts and the community accepting them. Those expressing a desire to convert were understandably viewed by rabbis with great suspicion. Given that anyone converting to Judaism would have to give up their family completely and live in relative isolation with a persecuted community, and risking death to do so, it isn’t surprising that Jewish conversions were few and far between in this period. This essentially remained the status quo until after the second World War, when Jews began to really integrate into mainstream society. With integration, we see the beginnings of the significant tread of conversion to marry someone Jewish, but also greater conversions of gentiles who were otherwise unconnected to the religion. That’s when things got complicated. The problem stems from the question: who is a Jew? The process of conversion itself isn’t really that difficult. The prospective converts must go in front of a beit din – a court made up of three judges. If male, he must be circumcised (and if he is already circumcised, a ritual drop of blood must be drawn). Converts must be informed of the mitzvot, and accept and agree to abide by Jewish law. Finally, they must be immersed in the mikvah. Those are the basics. Of course, most hopeful converts are put through a course of study that varies depending on who is converting them, and must demonstrate to the beit din a satisfactory understanding and knowledge of Jewish life, holidays and traditions. The difficulty arises between the differing branches of Judaism and how they interpret these fundamental requirements. For the Orthodox, Jewish law and practice have remained unchanged and cannot be changed. These are the words of God and it is not the job of humans to second-guess them. Therefore, someone wishing to convert must accept the laws and do their best to follow all of them. The other large Jewish streams – Reform, Conservatives and Reconstruction – are more liberal to differing degrees, as they all consider Jewish law (halacha) to be more flexible that the Orthodox do. From the Orthodox point-of-view, anyone converting in these movements has not been instructed properly and has not truly accepted God’s law. The conversion isn’t valid. So, who is a Jew? That entirely depends on who you ask. The truth is, it wouldn’t really matter so much if it weren’t for the problem – many call it a crisis – of a dwindling number of Jews, primarily through intermarriage. The latest statistics show that when a Jew marries a non-Jew, only about 30 percent of their children consider themselves Jewish. While everyone’s preferred response to this would be to have Jews simply chose to marry other Jews, that is not a realistic solution in today’s world. The liberal response is outreach. By welcoming the non-Jewish partner into synagogue life, they hope to encourage the non-Jewish partner towards conversion, or at least that any children will be raised in a more actively Jewish home. For the Orthodox, of course, this is an invalid response, and there are some Orthodox rabbis who won’t even convert someone for the sake of marriage, as it casts doubt upon the potential convert’s sincerity. Marriage is still the primary reason for conversion, but as we will explore in next month’s issue, there are many other motivations for choosing to becoming Jewish. And readers might be surprised to discover that even when people convert for marriage, many believe that Judaism was always their destiny and meeting the Jewish partner just made their path a little smoother. In November’s Bulletin, we will take a look at the community response to conversion. The Torah instructs us to “love the stranger (‘ger’ – also the word for convert), for you were strangers in the land of Egypt.” (Deut. 10:18-19) But there are still those who have not quite shaken off the legacy of hundreds of years of suspicions about a gentile’s desire to join the Jewish people. How welcoming is our community towards those who chose to be Jewish? As this whole fuss over funding religious schools picked up heat, it got me pondering why sending my kids to Jewish day school (as opposed to afternoon school) mattered so much. There certainly is the utilitarian reason of not having to send them to afternoon school, which would complicate our lives further. The school also has small class sizes, which means shy Maya is more willing to participate and Asher is getting marvelous support for his handwriting problems and gnat-like attention span. But that has nothing to do with being in a Jewish school. My kids attend T… [I edited out the name of the school for the blog]. As our third child prepares to enter kindergarten, this is starting to cost us a whole heck of a lot of money. I occasionally count up the thousands and dream of vacations and a paid-off mortgage. But despite the lure of all that freed-up money, I just can’t do it. I can’t bring myself to take my kids out of Jewish day school. Lately, as kid number three brings our costs to an all-time high, I’ve been ruminating on why it means so much to me, to have my kids at T…. As a Jew-by-choice, it isn’t like I have any personal scars of having to stand out in the hallway at public school during the Lord’s Prayer, the way some of my friends have described. Perhaps it is my position of always having been in the majority as a kid, going to a school where pretty much everyone was like me. It is a comfortable place to be, I must admit. I’ve been thinking back to my experiences when I first converted, and found myself in the minority for the first time. The Christmas after I became Jewish, I arrived at work one day to discover that the ‘holiday planning committee’ had festooned the office with the traditional Christmas decorations. But whereas the year before every office door had some large decoration taped to it, this year, it was every office door but one: Santa, a Christmas tree, Frosty, nothing, a wreath, a candle. It mostly struck me as silly. It isn’t like I would have thrown a fit to find a snowman on my door and I realize it was their attempt to respect me, but it did rather single me out. They also changed the ‘Christmas lunch’ to a ‘festive lunch.’ I wasn’t fooled. It got stranger for me when my first child was born. I remember taking her to her daycare’s ‘winter party’ when she was three years old. Despite the caregivers’ sensitivity in giving her a dreidel cookie cutter to make decorations while the others got Santa Claus and trees, they had failed to mention that Santa himself was going to drop in. She had more than your average toddler’s reaction of shock when this huge red guy showed up, as she’d never seen him before and had no idea what he was doing there. I had not known how to explain him to her, so I’d never bothered, until we were confronted with him in person. It felt like a relief when she started Jewish preschool the next year, and not just because I got to avoid Santa Claus. I really appreciated not explaining our every holiday and defining her vocabulary for her teachers when she talked about Shabbat or building the sukkah in the backyard with Dad. 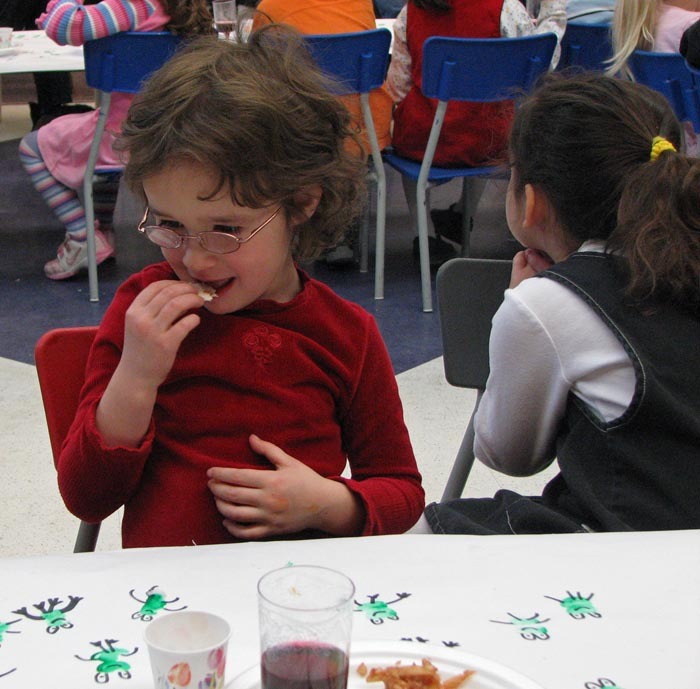 I have one friend who challenged my decision to send my kids to an all-Jewish school (she isn’t Jewish), saying that she loves that her kids are exposed to all different cultures at school, and that is the essence of Canada. While that may be true for her, I pointed out, her kids are still in the majority, getting a taste of this culture and that. If my kids went to her school, they’d be the ones her kids were being exposed to. I want them comfortable with their own culture and religion before it becomes their job to explain themselves to others. As anyone who sends their children to Jewish day school knows, just because my kids go to school with other Jews doesn’t mean the live in a bubble. 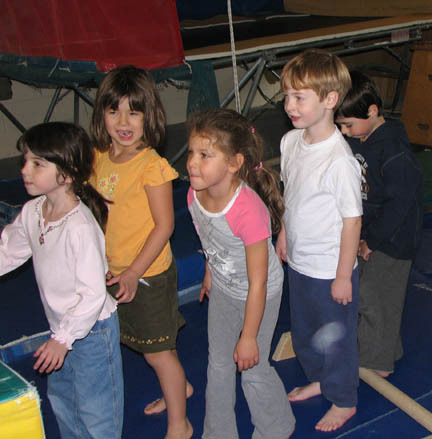 They still meet non-Jewish neighbours and make friends with kids through sports and other after-school activities, learning about other cultures that way. But they learn from a position, however briefly, of feeling as though they are in the majority. Yes, we agreed, he certainly does. Boo at her model seder at school. Check out the plague of frogs on the table cloth.